Originally named Alva, Blaine, Maine was named after House Speaker James Blaine on the promise that he would donate a bell to the new town hall tower. According to record, Speaker Blaine never made good on his promise, and the building still stands without a bell, but the name stuck. 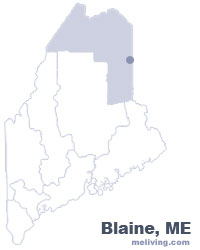 To share any Blaine, Maine information with us, please contact us. Learn more about advertising in MELiving.